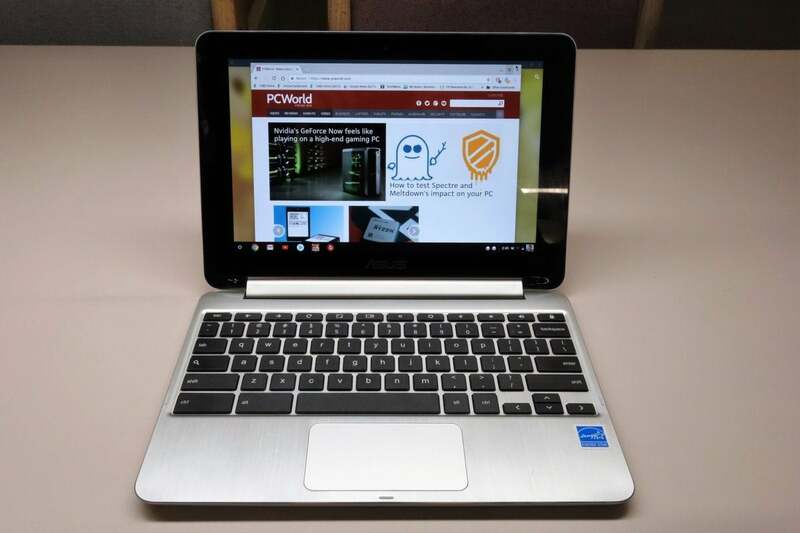 Asus Chromebook Flip (C101PA) review: Is this convertible the future of Android tablets? While the 10.1-inch Asus Chromebook Flip feels a bit small for everyday productivity, flipping this convertible into tablet mode and launching a game unlocks its real value: as a hybrid Chromebook and Android tablet. 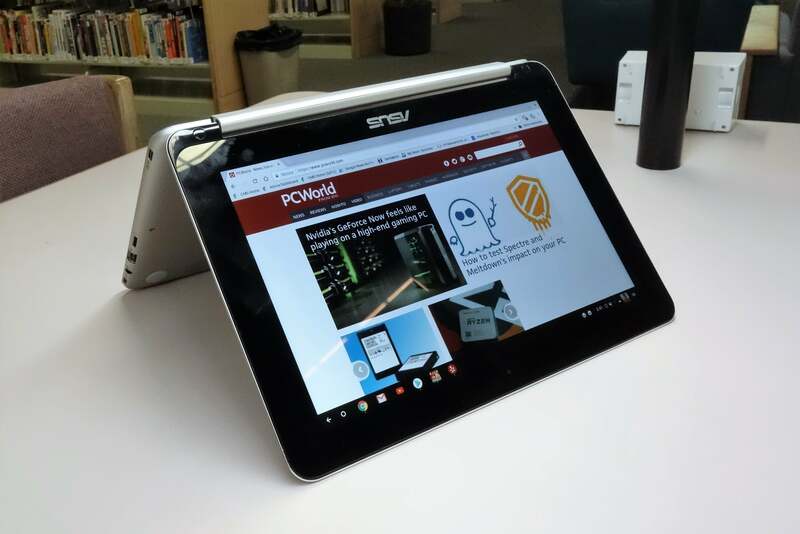 True to its name, the convertible Asus Chromebook Flip (C101PA-DB2) can flip backward into a tablet. Given its compact size, you could just as well say you’re buying a 10.1-inch Android tablet with a keyboard attached. Such a concept would have been sketchy just a year ago, when Google started making Android apps available to its newest crop of Chromebooks. And it’s true that neither Asus nor Google have completely solved the problem of how to re-format content for landscape-oriented laptop screens, let alone convince you that you’d prefer a Flip over a sleek, lightweight Galaxy Tab. But the Flip is a bit small for productivity with adult-size fingers (though fine for the hands of my children, who frequently asked me if they could “help test it”). This $300 Chromebook’s real value is in combining an Android tablet and Chromebook into a single package, powered by a no-name processor that will handle everything you throw at it just fine. The Chromebook Flip effortlessly folds back into tent mode, and from there into a tablet configuration. The Chromebook Flip is small, thin, and light, which means you’ll inevitably come up short on some features that simply won’t fit into the chassis. The specs and features on this small Chromebook are adequate, though I’ll get into some shortcomings later on. 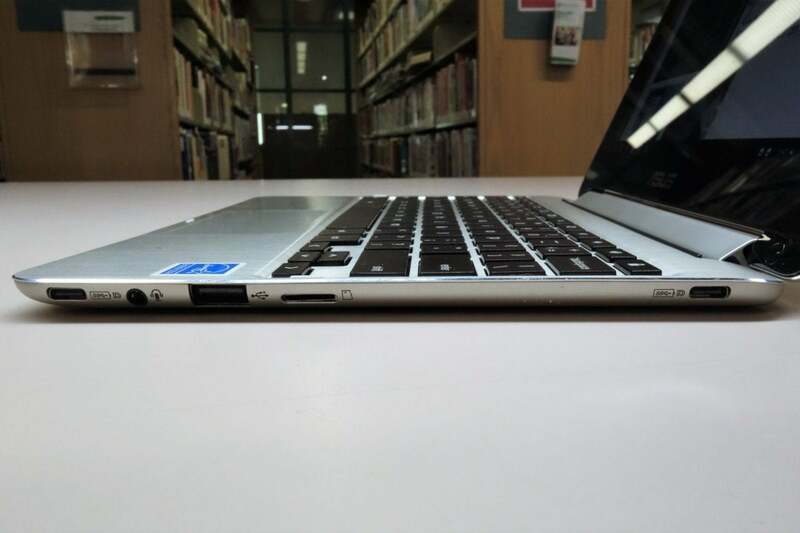 Some Chromebook makers seem to favor a brushed-aluminum chassis, rather than the cheaper plastic of old. The Chromebook Flip C101PA-DB2 follows suit, giving it a deceptively rugged look. A central hinge allows the tablet to recline essentially 360 degrees, back through a tent configuration into tablet mode. 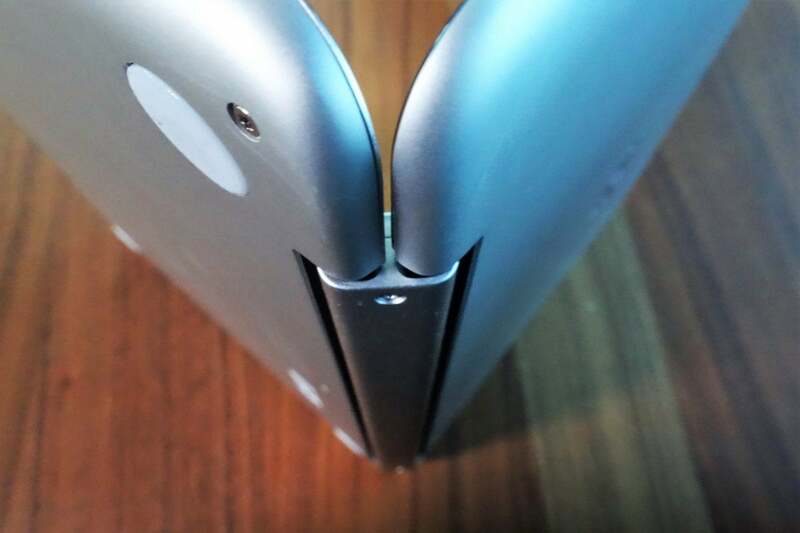 A sturdy hinge allows the Flip to rotate nearly 360 degrees, folding back on itself. The Flip’s display suits its relatively small size. The screen looks noticeably brighter when viewed from the front, which is true of most LED-lit panels, but its 178-degree viewing angle makes images visible even when looking from the side. Note that the resolution is specified as 1280x800 pixels, which is its “Best” mode. If you go into the Device menu in Settings, you’ll find a virtualized 1440x900 option that increases the resolution at the cost of a bit of blurring or fuzzing. There’s nothing too unique about the Chromebook Flip’s keyboard, save for its small size. Asus embedded the Flip’s speakers within the keyboard, not the tablet as most manufacturers of tablets and two-in-ones do. Those down-firing 80dB internal speakers generated an almost overpowering volume of sound when playing back Kanye West’s “All of These Lights,” with the sound reverberating off the work surface. Typical of laptops and Chromebooks, the sound is disappointingly flat on the low end, though headphones resolve most of those issues. While the Flip encourages you to invest in USB-C peripherals, a legacy USB-A port is a convenient addition. The internal eMMC storage is supplemented by an SD card slot. If this were a regular tablet with a rear camera, you might rightly be concerned that the SD card would fill quickly with images. However, the Chromebook Flip doesn’t have a rear camera (it would be blocked by the keyboard as it folds over), so the extra storage will likely be available for Android apps. The Flip’s keyboard is another drawback, as the compact form factor—nearly a full inch narrower than a standard desktop keyboard—will likely cramp most adult fingers. To be fair, I was able to type accurately, though I certainly didn’t want to do so for long periods. 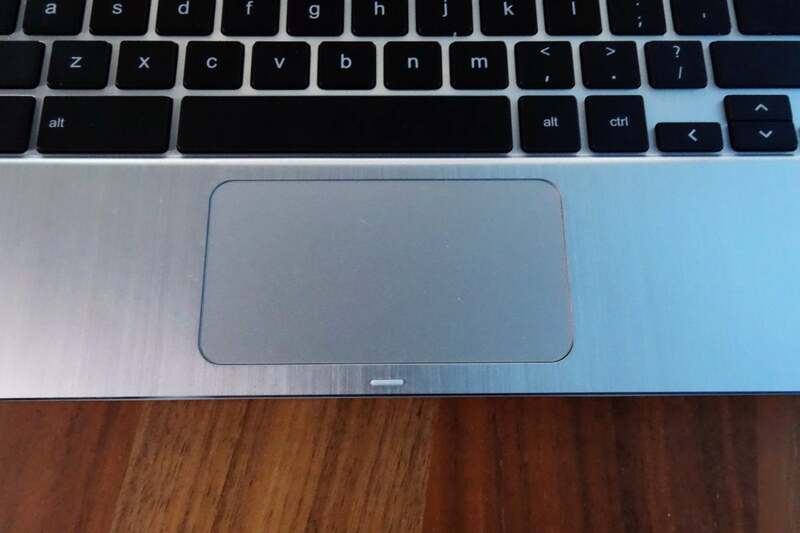 The touchpad, though also on the small side, offers decent feel and responsiveness. The Flip’s touchpad is comfortable and responsive. Interestingly, my 10-year-old son felt differently. 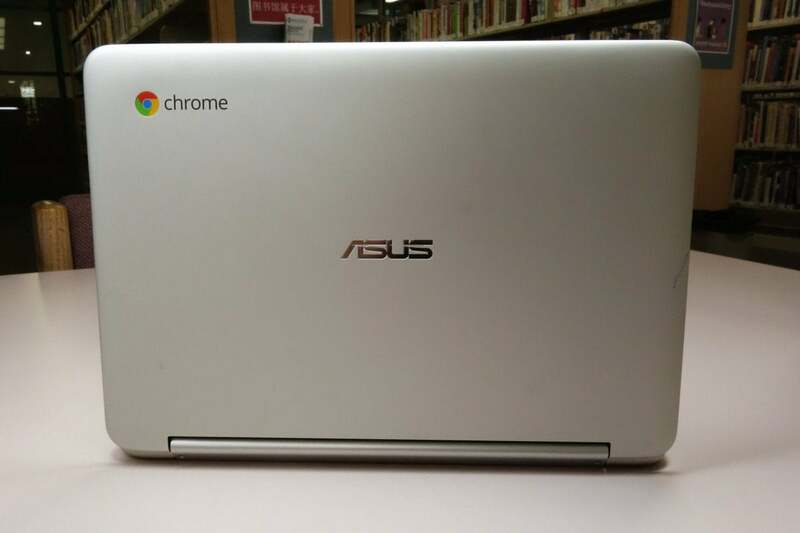 Chromebooks have become a staple of American classrooms, and my son has used a Chromebook daily for at least two years. He had no issue with either the smaller screen size or the keyboard, and reported that the keyboard was flatter and easier to type upon than those on other Chromebooks he’s used. Knowing who you’ll buy the Flip for—yourself? your kids?—may affect your decision. Though Chrome OS added support for Android apps early in 2017, the feature spent most of the year in a sort of limbo. Android apps on Chromebooks were technically beta products, and only the most recent hardware supported Android. In desktop mode, Android apps simply don’t, and can’t, take advantage of the screen orientation. A year on, the situation is steadier, if still not perfect, given the challenges of translating Android onto a Chromebook. Google Maps still plants a vertical column of suggested sites within the “Explore” tab of the Google Maps app, for example, as it did last year. In desktop mode, launching a vertically-oriented game like Angry Birds Pop carved out a narrow slice of my screen containing the game. Switching the screen back into tablet mode reoriented and resized the game so that it filled the entire screen in portrait mode. The process wasn’t instantaneous; in fact, it took several seconds for the Flip to resize and reorient the game, during which the display was worryingly black and seemingly unresponsive. 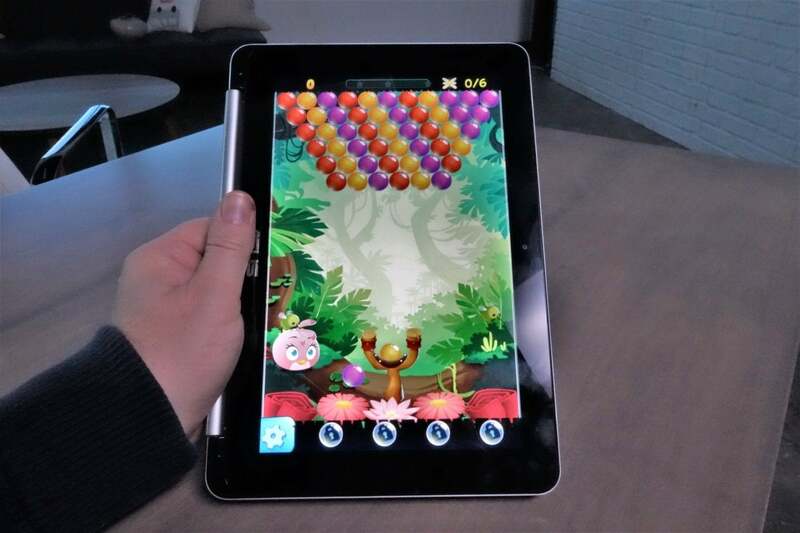 Flip the Flip’s screen back, though, and suddenly you have a large Android tablet. Nevertheless, the basic point stands: In tablet mode, the Flip acts like an Android tablet. If you load desktop-like Android apps like Microsoft Word or native Chrome apps like Google Sheets, the Flip mimics a desktop PC. When things click into place properly, it's the best of both worlds. Just remember that certain apps are optimized for phones, rather than for computers pretending to be phones. Because the Flip lacks GPS, for instance, Yelp must use Wi-Fi to approximate your location. And forget about playing Pokemon Go—the Flip lacks the requisite rear camera. Chances are that you’ll buy a Chromebook without once considering the chip inside of it, but the Flip's is worth noting. It uses a microprocessor made by Rockchip, a Chinese microprocessor designer you’ve probably never heard of. And that’s the point: Google rebranded the chip the OP1, apparently in a bid to make it a bit sexier and remove any concerns about buying a Chromebook that’s powered by an unknown manufacturer. 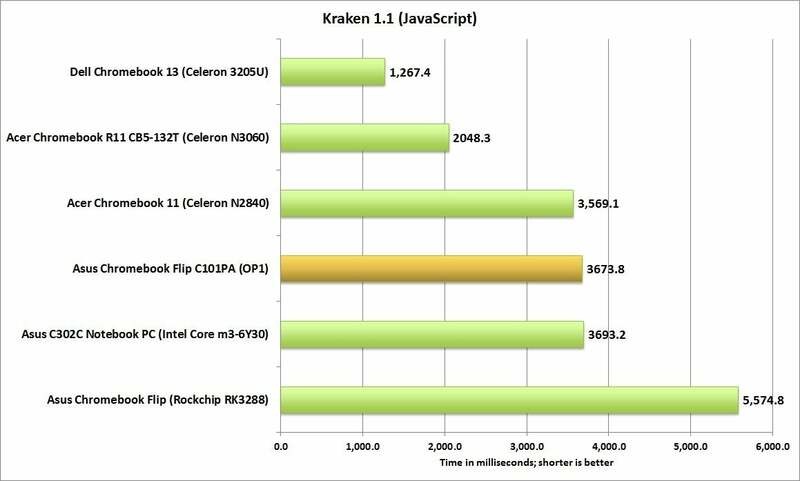 A previous version of the Chromebook Flip that we tested officially uses the Rockchip RK3288. Inside the OP1 (or the Rockchip RK3399, if you prefer) is an ARM chip, specifically a dual-core Cortex-A72 and quad-core Cortex-A53 with separate NEON coprocessor, alongside a Mali T860 MP4 GPU. ARM licenses these cores to companies like Qualcomm, Samsung, and Rockchip, which can tweak and combine them as they’d like. In very broad strokes, what the OP1 does is combine the A72 cores used by 2016 smartphones with separate CPU cores that emphasize low power. 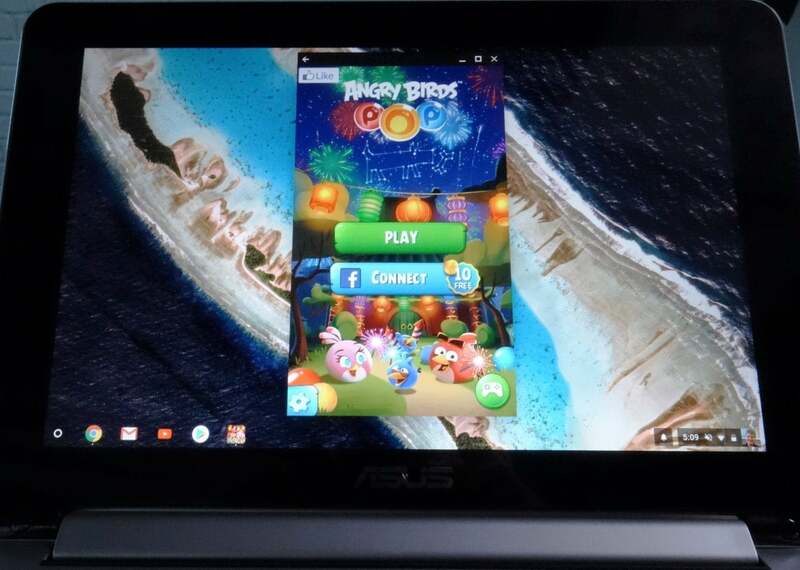 Chances are that any game an Android phone can tackle, the Asus Chromebook Flip can, too. My experience echoed that: Games like Asphalt 8, a bang-‘em-up arcade racer for Android, ran smoothly, as did a number of other Android apps I tried out. Though neither YouTube nor Netflix will output 4K video to a machine that can’t support it, the Flip smoothly rendered video from both sites. Using a “reverse KVM” gadget specially sourced from Korea, we even performed some unique head-to-head testing against an HP Chromebook 13, powered by an Intel Core m. Using a single mouse and keyboard to control both machines simultaneously, we opened a dozen Chrome tabs and navigated around several sites. While the Flip was very slightly laggier and bumpier while scrolling up and down, our conclusion is that you’d only notice when directly comparing the two. Given that HP’s Chromebook costs $500 more, that’s a strong endorsement of the Flip’s bang for the buck. 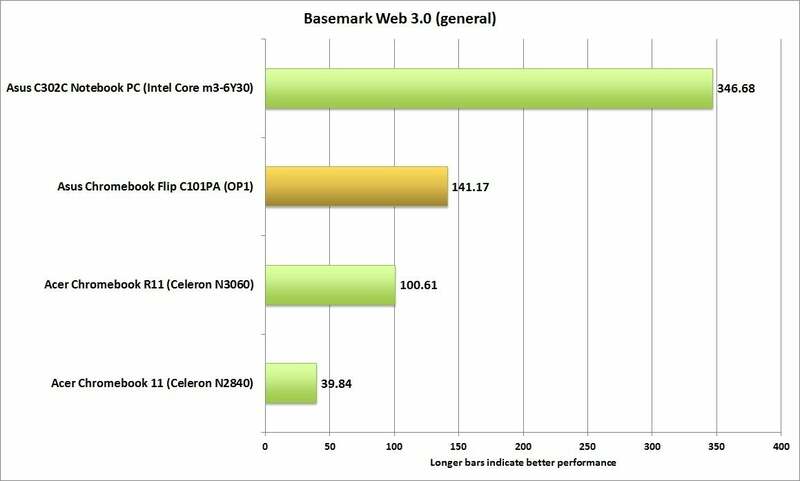 When we officially benchmarked the Chromebook Flip, we sought to compare it with other lower-end Chromebooks, running mostly Celeron processors (plus we threw in the aforementioned older, Rockchip-powered Chromebook Flip). These tests put the Chromebook Flip in the middle of the pack—not too shabby, really, for a $250 to $300 machine. One caveat about our performance charts: Because Google updates Chrome OS every six weeks or so, from a software perspective we're essentially comparing new apples to older apples. The Asus Chromebook Flip ran Chrome OS build 63.0.3239.140, while all the other machines in our charts were benchmarked on earlier versions. Each synthetic test we use stresses the Chromebook in some way, from generic productivity tasks to specific functions. 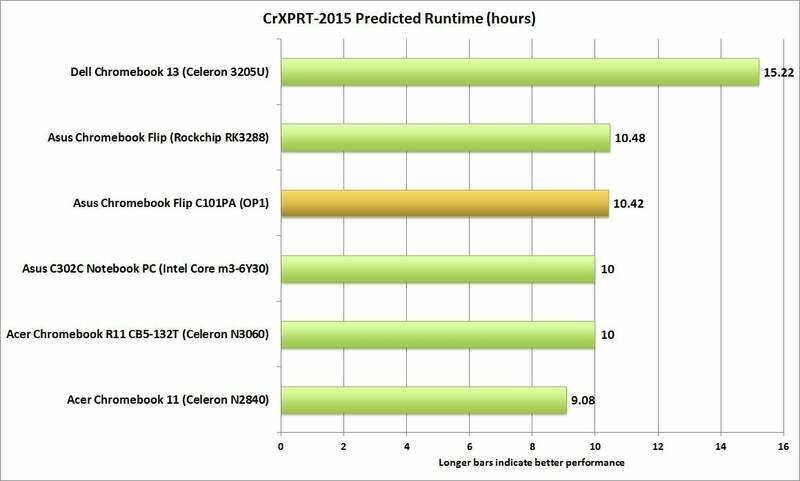 The first, cr-XPRT, is similar to the WebXPRT tests we use to evaluate web browsers, but optimized for Chromebooks. It evaluates performance in basic productivity tasks like word processing, as well as more demanding activities like watching movies or playing games. While the old Chromebook Flip brings up the rear, the latest Chromebook Flip advances to a solid midpack position. 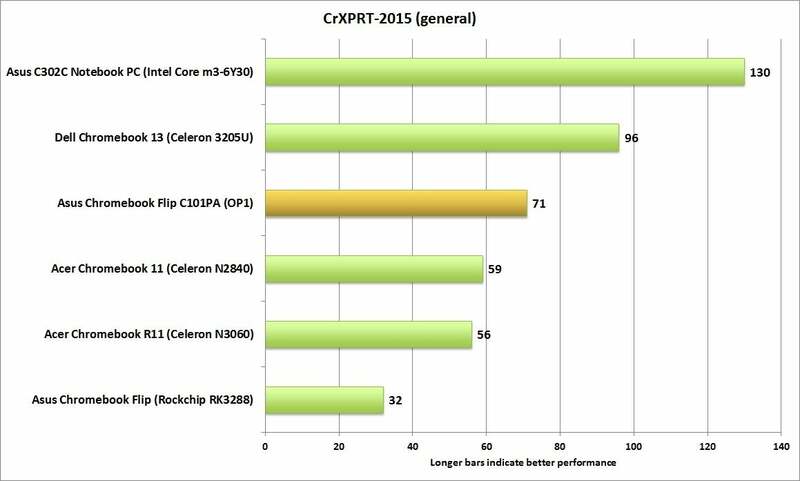 While a Core m3-based Chromebook easily outpaces the Asus Flip, its OP1 Rockchip chip runs with the Intel Celeron pack. Again, higher-performance Core based chips steal the performance crown, but the Flip still does well. 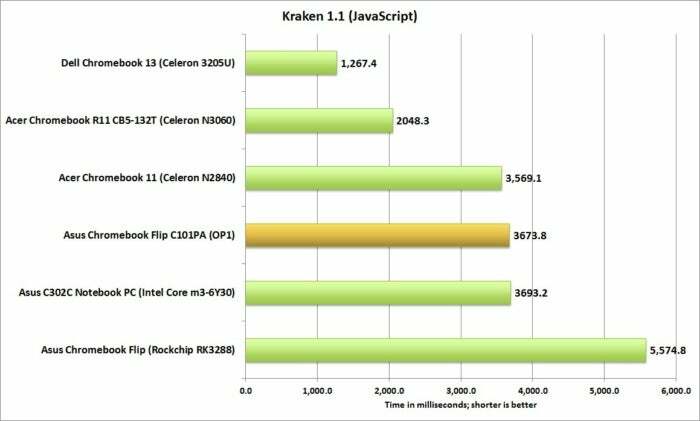 The Asus Flip is comfortably in the middle of the pack as measured by the Kraken benchmark. To estimate a Chromebook's, battery life, we use Cr-XPRT’s synthetic battery test, standardizing the results by setting the display to 200 nits and connecting headphones with the volume at 50 percent. The Flip performs well, with a projected life of almost 10.5 hours—nearly identical to its predecessor's time. Battery life is another area where the Flip performs acceptably. By now, most of us probably think of Chromebooks as a catchall category, with individual models distinguishing themselves via incremental nudges in performance and battery life. Pricey Chromebooks like the Google Pixelbook reside in their own niche, trying to emulate the price and performance of a PC. The Chromebook Flip feels like something new: the fusion of the medium-sized Android tablet with a Chromebook. Nature doesn’t necessarily favor new mutations. The Flip feels a little large for a tablet, and slightly too small for a Chromebook. 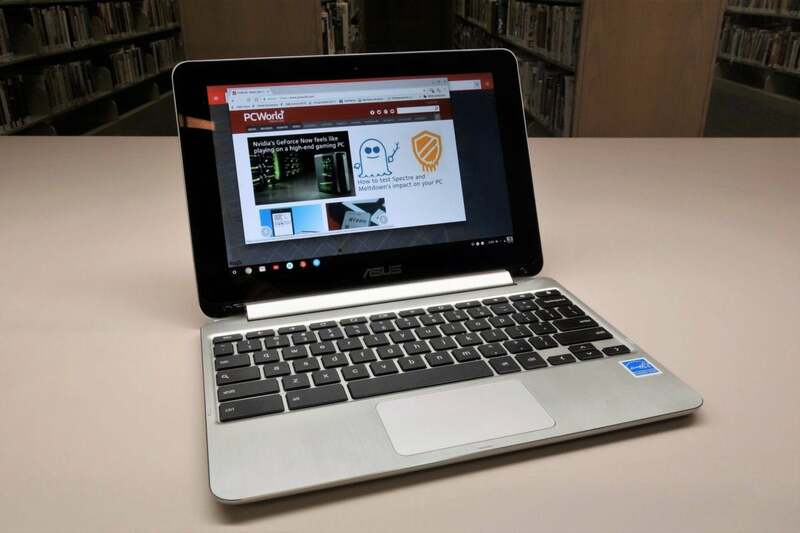 But one thing seems certain: If a Chromebook supports Android, it needs to be a convertible. Here, the Flip has the right idea. While the Asus Chromebook Flip C101PA feels a bit too small for adult fingers, parents may find that the combination of a Chromebook and an Android tablet experience offers compelling value for their children.